A powerful light source projects a beam of light onto a large disc of translucent fabric in Daniel Rybakken's latest lamp design for Luceplan. Called Amisol, the large clean-lined suspension lamp recalls a solar sail with its directional light source that shines onto a large fabric disc. The disc, made up of a circular aluminium frame with a translucent white film or metallised mirror-finish membrane stretched across it, reflects and spreads the light around the room. 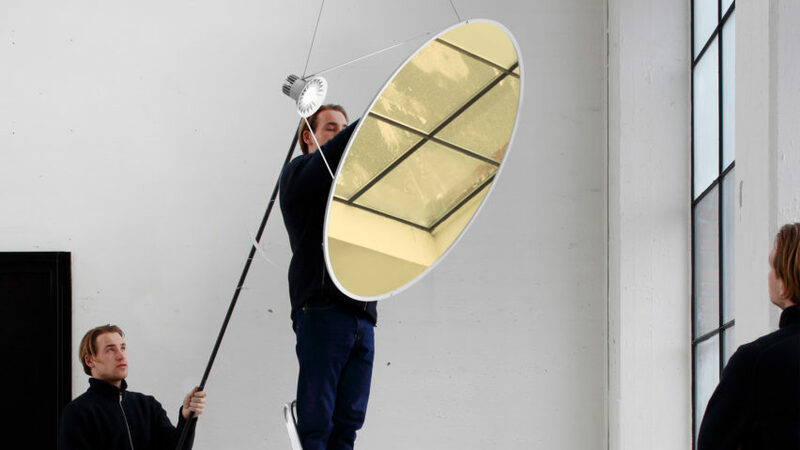 The fabric disc is attached to the light source by two slender rods that can be adjusted in length. The points of contact of the lamp's two support wires can also be adjusted allowing users to rotate the disc and change the angle of the lamp. "Amisol is an evocative and dramatic suspension lamp that blends aesthetic refinement with surprising technological complexity, in a functional bond between art and design," said the Italian lighting brand. "Rybakken’s remarkable ability to interpret light with an original, minimalist approach is channelled here into a lamp that occupies a large physical space, with a directional volume reduced to a minimum of signs." The scale of the lamp makes it suitable for a variety of different spaces, from large residential spaces to hotels or restaurants with unlimited space constraints. "Amisol is suitable for residential use, but also for the contract and hospitality sectors," it continued. "The light masterfully reflected and spread by the circular structure gives the product a theatrical and poetic quality at the same time." The collaboration is the latest of many between the Norwegian designer and the Milan-based company. Other products include a Compassi d’Oro award-winning table lamp that dims as it's pushed down its own thin vertical stand, and a suspension lamp that features a single, large central light source surrounded by an arrangement of glass spheres.